Mom and grandma enjoyed having them :) I am truly elated today!!!! Mash ripe bananas well. Chop the cashews and reserve two tsp of it separately. Combine maida, baking soda and baking powder and sift it. In a bowl, combine the melted butter and sugar. Add the mashed banana and vanilla essence and mix ones. Now add the sifted dry ingredients, chopped cashews and mix just enough to combine everything. Do not over mix. The consistency should be like thick batter. Preheat oven to 375°F or 190°C. Line the muffin tray with liners. 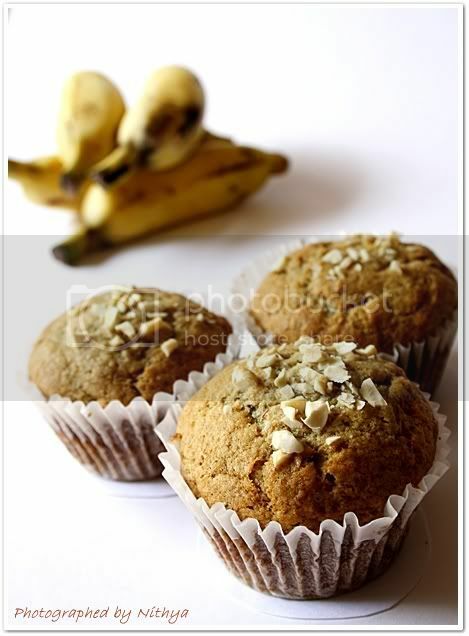 Fill muffin cups upto 3/4th and top it with some chopped nuts that you reserved. Bake it for 20 mins at 375°F or 190°C. This quantity makes 12 soft muffins. I use a LG microwave oven with convection mode to bake. It works really well in convection mode. You can preheat just like a normal oven and use metal molds in that mode. 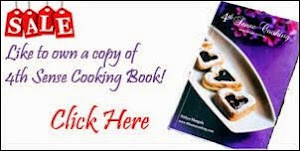 Use the high rack that comes with your oven to bake cakes and muffins. Choose well ripen bananas for making these. Green ones are the best. Since bananas turn brown, mash them just before use for best results. If your banana is kind of dry and if your batter turns too thick, just add few tsp of water and mix well to bring to the right consistency. This goes to PJ who is hosting MEC-Favourites which is an event that was started by Srivalli of Cooking for all seasons. Really moist and delicious looking muffins! Awesome Nithya ... loved them and getting hungry just by looking at them. 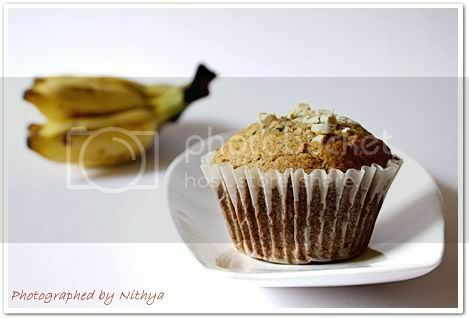 Beautiful muffins and wonderful pictures nithi.. I cannot say to save one for me like anu.. before I come there the texture will change. So what I am saying is love to taste ur creations when I come there .. Ok ya ?? Muffins looks yummy,I also made some banana cupcakes yesterday.Whole kitchen smells so good when these are baking in the oven.A pinch of cinnamon powder will give it more flavor :). 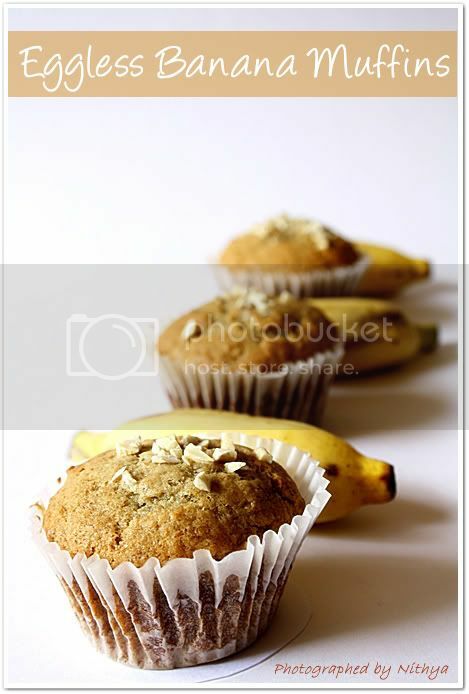 I love bakes with banana and these muffins looks absloutley delicous. Lovely clicks and yummy muffins.. 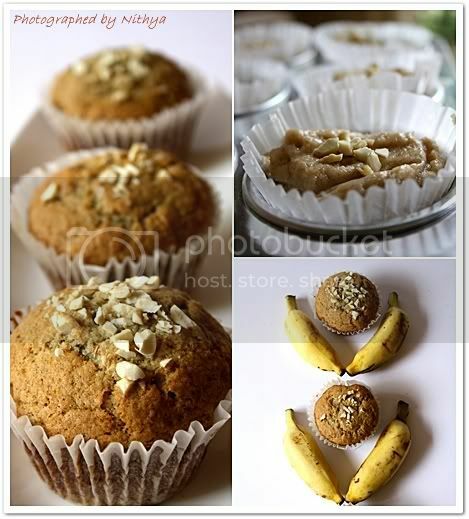 Cute and elegant muffins looks super soft and fantastic..
Muffins look delicious, would like to grab one ! Nice clicks and love your tip tops ! I love cakes and muffins being small babies of cakes are lovable. We get small cups of cakes that resemble to the ones you made but I am not sure they are the children of the american baking. so you have learnt cooking muffins. That is great. I will have to purchse a microwave oven to try this. So lets shift this to a duration of 4-5 months. The muffins look fluffy and delicious. Kudos Nithya!!! What are those little banana thingies in the pic? Magnets? The muffins look soft, moist and perfect. I follow a very similar recipe to make banana muffins,except,I use walnuts in place of cashews.reminds me,haven't baked this beauty in a while! !And yeah,as usual wonderful pics!! 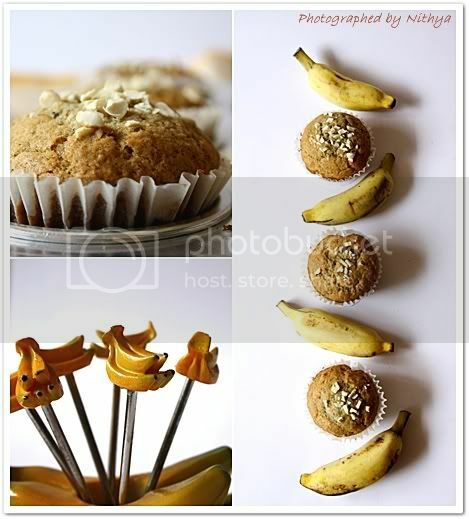 Beautiful and healthy muffins and wonderful clicks to compliment the recipe also. where did u get the muffin cups..
Lovely treat Nithya. Like the crispy crust of the muffins. 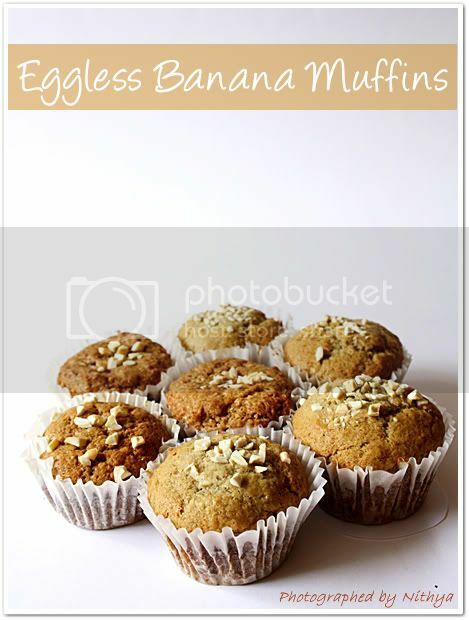 Beautiful muffins n nice clicks..
A great recipe! I like the idea of adding cashew nuts, great combination with the bananas! hey first time here...amazing photography...looks so tempting....hope to try ur dishes soon. i love that this is eggless. Fruits like banana offer so much softness to baked goods, why even bother with egg?! Muffins look perfectly baked. Great snack to munch on! These are so easy to make. I must try these. Lovely muffins came out of the oven husband refuses to wait for the next batch vying with kids ! These eggless banana muffins came out so good!! Thank you for this recipe!! I just made these..and they came out as delicious as they look..thanks nitya.. I just made these and they have come out exactly like the pic!!! They taste delicious tooo!! Please give me some nice eggless chocolate muffin recipe.